These four dashing gentlemen are multi-talented, hardworking and equally funny. They create ‘Dhoom’ with every video they upload on their YouTube channel. They can act, dance, sing, DJ and bring smiles on everyone’s faces. Q – Who came up with the name ‘DhoomBros’ and why this name in particular? 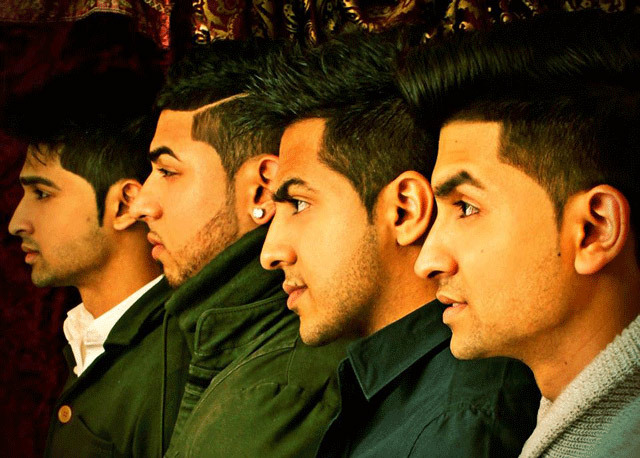 Waqas : DhoomBros started when Shehry and Hussain did a school performance on ‘Dhoom Again’ on a talent show and everybody there loved their dance so much and were so impressed that the people in the school started calling them DhoomBros as they were bothers and they danced to ‘Dhoom’. Then the name caught on all around the school and then they started making YouTube videos and they actually kept the name DhoomBros. Q – How did you guys end up making videos and uploading them on YouTube? Hussain : We started off by making very low quality videos. Just for fun, we would put cameras in front of us and then Shehry would start hitting me, beating me up and I would act like I’m getting hurt. We started off like that and then his friends started watching those videos and they were pretty cool so they liked it. So we thought maybe if we continue like that then we might get somewhere with it. In the beginning we didn’t have hope but now it’s more of a profession and it’s what we want to be. Q – Do you guys remember the very first video that you uploaded? Waqas : The first video that we uploaded was when phones had video cameras and it was new that time, I guess in 2006. The recording limit was 30 seconds. We recorded 30 second clips on the phone and made it into a movie kind of thing and uploaded that. It was actually just for fun and we really enjoyed it. Shehry : Yeah, the first one was on the phone camera and we were giving background music from our mouths. Waqas : Yeah, I was singing like tananaaa…. and we wrote down credits on paper. Hussain : Yeah, and then we recorded the paper to show credits. Shehry : There was no editing involved. Like, we had to stop recording when we were done. So that was the first video that we uploaded. Q – When did Atif join you guys? Atif : I joined in around three years ago when the first ‘Dolly Aunty’ video was being made. Before that I was also in the video ‘Bollywood Scenes’. I came into DhoomBros because my friend, Shehry invited me and told me to do this for fun. I remember he called me home and when I came home he told me that we’re doing something called the DhoomBros and I want you to have fun with us. So I said yes and it started with ‘Dolly Aunty’ from there the journey has been great. And Shehry has been my friend from a long time and then these guys too. What we do, we also do it for friendship. It’s not just a YouTube channel for us. It’s our passion and we enjoy ourselves. It’s our journey for life. Q – You guys are amazing dancers and you act as well. So what do you enjoy more, acting or dancing? Hussain : For me personally, I like acting more but dancing is also a hobby. Acting is what I really wanna do. I wanna be an actor. Waqas : I would say acting as well. Dancing is once in a while thing but acting I would like to do more often. Atif : Yeah, I’m a great dancer. Atif : Actually, I love acting. Atif : We are still learning. To be honest, if you give me option of directing, I would say that because I love directing. Behind the camera is a lot of fun. So that’s what I love doing. Q – Were your parents supportive of what you did when you guys had just started? Shehry : Yeah! Every time we made a video, we showed it to them. We showed them the first few videos that we made and they would tell us whether it’s good or it’s bad. My dad would tell us this is good, this is bad. My parents were always supportive of what we did. But as long as we kept it PG-18, they were okay with it. Hussain : PG-13. PG-18 is…..
Waqas : Yeah PG-18 is……well, not what it should be. Q – You guys recently completed one year to ‘The Perfect Memory’ and you’ve received an award for it as well. How does that feel? Shehry : We filmed it and then submitted it to a competition and we won an award for it. It came in first place in the whole Tri-state area. We felt good about it. We put a lot of hard work in that because it was too cold and the conditions weren’t favorable but that was our first long video. It was of 18 minutes and I think it was worth it. 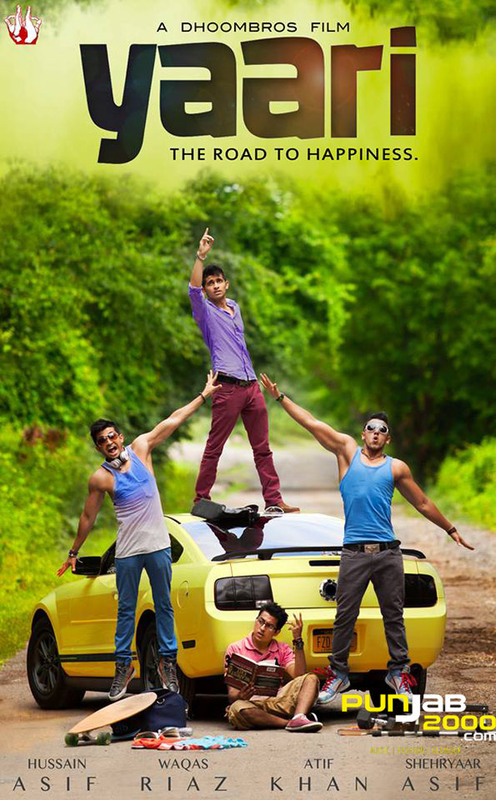 Q – And you guys are also starring in a film called ‘Yaari’. What is it about? Hussain : It’s our first film, our first really big project. It’s more fun because we’re doing it as a whole, as a group. We’re not involving a lot of outside people. It’s more fun and at the same time more complicated. Because it takes a lot of effort specially when you’re learning from each other and using it in the movie. We don’t have outside experience. We are learning from each other and it’s from our own experience that we’re making a film. It’s a very challenging thing but its fun because we are working with people we’re used to working with. Q – What are the characters that you all are playing in ‘Yaari’? Waqas : I’m playing a very insecure and nerdy person Faraz and throughout the movie, these guys are gonna to help me in finding my confidence. Hussain : I’m playing Armaan. He is the main lead and he is in love with this girl and his story revolves around what happens between him and the girl. Atif : My name in the movie is Danny. He is an American cultured boy. He doesn’t have parents and is spoilt. He is not used to having any family with him but he has good friends. He is very close to Shehry’s character, Zeb. You can say that he is the bad boy in the group. Shehry : My character’s name in the film is Zeb, the name is actually Jahaanzeb but everyone calls him Zeb. He is a student. His parents live in a different state and he wants to stay in New York for his skating competition. He’s always cracking jokes and is the funny guy in the group like I am in real life too. Q – You guys recently finished shooting for the webseries ‘iDeewane’. And it is not like the other videos that you make. It had a lot of emotional scenes as well. So was working in it emotionally exhausting for you guys too? Hussain : I learned a lot from iDeewane. At first, I thought I wasn’t gonna learn much but I ended up learning patience. Because having fun with videos is another thing. It’s what we do all the time. But in iDeewane, we had to be serious. We had to listen to the director and to the lines he is telling us. Sometimes, you don’t wanna do that but you still end up doing that and I guess that’s how you learn working with different people. And that is exactly what I wanted to learn. I wanna be an actor. So I would have to work with other people. It’s kind of hard but I’ve learned a lot from iDeewane. Waqas: The thing is that when we started iDeewane, we thought it would be just like any other video that we’ve made. But throughout the journey we found out that it was much more complicated and much more difficult. It was a challenge for us. We had to keep up with it and it was a good journey. Q – Who comes up with the concepts of the videos that you guys make? Hussain : We all do. Shehry : Yes, we all do. We all put some efforts and ideas and it all comes together while we’re making it. Hussain : We put more ideas while shooting it, right on the spot. I guess that’s what makes us ‘The DhoomBros’. Waqas : We just go with the flow and improvise as we go. Atif : Its very simple for us because we four do it together. We all prepare the story and add to it. We all put equal efforts. We work like brothers so it’s all of us together, not just one. Q – Do you guys ever get criticized by people? Hussain : Yes, we do. Face-to-face, not a lot of people have courage to say that they don’t like the last video or something like that. But online, I’m sure. Not that I read a bad comment unless they are criticizing in a really bad way. But we do work on those things that people don’t like about the video for the next project. Waqas : Basically, at the end of the day, we’re making our videos to make our fans smile. So whatever makes them smile, we’re gonna do that. Q – You guys don’t even react or block to those hate/anti-Dhoombros pages that we sometimes see on Facebook? Waqas : Blocking them would mean giving them attention. Why give them more attention? Shehry : These kind of things don’t really worry us. We get a lot of love from people. Waqas : There’s so much love out there that we really don’t see the hate. Atif : You see, we want to have a brighter future. So we see brighter side of things. We have goals to achieve. We can’t let things like these affect us. Hussain : People are actually putting a lot of effort in making a page and put pictures on it which means they are taking out time from their life to actually go though the picture, edit them and put them up there. Atif : So I guess, they just want attention. So we don’t mind. Q – You guys are adored by so many girls and people. How does it feel getting so much love from ‘Dhoomies’ all around the world? Shehry : It feels great because we’re loved by so many people not only girls. Whenever I go outside, I see adults and aunties coming up to me and repeating lines from ‘Dolly Aunty’ and telling me that they love it because they can relate to it. I feel like I’m in everyone’s houses right now and as a character go into their houses and be a part of their lives. At first, it was just for fun and for friends but now we’ve realized that we are going into homes and families. So we act in a way that we don’t disappoint them. Waqas : The best part is that our audience can relate to us. So as long as they are relating to us, they’e gonna keep watching and enjoying our videos. Hussain : And when you get so much love, you wanna work harder. The love motivates you to work better, harder and be funnier and just keep growing. Atif : Our main motto is to bring smiles on people’s faces. That’s all we want. Q – Out of all the videos that you guys have done, which is the most memorable one for you? Atif : For me, ‘Blessings of Ramadan’ was the most memorable one because we went through a lot of stuff that time. And it would always be the most memorable video for me. Hussain : I would say ‘The Perfect Memory’, because that was the first time we wanted to do something out of the comfort zone. It was winter and it was very cold and it had a story to it and also an end. Waqas : It was something that we don’t usually do. We had to come out of our shell to make this video and it was really difficult. There were many challenges throughout the way and I would say that it is the most unforgettable video for me too. Hussain : I was also a part of it guys. Shehry (laughing) : Oh yeah! But it was a lot of hard work. We knew we had to do something big and we had to give it our best. I’ll never forget that. So that was the most memorable video for me. Atif : That was the first ever serious video that we had done on a very big scale. It was our first religion based video. Q – You guys are so famous and fame changes people. Do you think it has changed you? Waqas : I honestly didn‘t think that we can be closer than we were but that conversation we had for four hours actually made us ten times closer than we were. Shehry : I do feel that fame could change you. But if you have people and friends in your life who are supportive and always on top of you then it can’t change you. Atif : We are not a group. We are a family. Hussain, Shehry and Waqas are my family. We are so close. We support each other always and that is the main reason why fame hasn’t changed anything between us. Q – When you guys started that time there weren’t many Desi youtubers. But now, everyone is making YouTube videos. So do you feel competitive or you feel the competition with them? Hussain : I think we, whoever are the Desi and are youtubers, as a whole should support each other. We are competing against others not brown or Desi people. I think we all need to stay as one because if we don’t love each other then who’s gonna love us? So we have to be supportive of each other, no matter who it is. They are not our competition. They are doing a good job. Our competition is everybody else. Not the Desis. Waqas : We wanna make our name so that the other people also wanna watch our videos and enjoy then and wanna get to know our culture more. Q – At this point, do you feel the pressure to get more subscribers, more views and more fans? Atif : We don’t wanna just stay in this ‘getting more subscribers, views’ kinda thing. We wanna make it big. We don’t wanna keep it to YouTube. Our dreams are above all that. We wanna be known all over the world. We never think about subscribers or views. All we care about is the quality of the work that we’re doing. We want our work to be really good. And if it’s good then it will automatically be a hit. And we want Hussain to be an actor and make it to Bollywood, InshaAllah. And we think he will because he is working really hard for it. Q – In your life, what is a normal day like? Hussain : If you watch any of the Vlogs that Waqas puts up, than I think you know what we really do. Shehry : Yeah. Right now, it’s a very normal life. And we wanna keep it that way. Hussain : but when it’s time for shooting, it’s a lot of hard work and shooting as in, shooting for ‘Yaari’. Otherwise normally, we have a lot of fun. Q – Do you guys hit on by girls a lot in public? Waqas (laughing) : That, Shehry’s gonna answer. Shehry : Well yes, Of course. Many girls have been hitting on Hussain, Atif and Waqas. (laughs) But seriously, many girls come and want to take pictures with us. I don’t take it in the way that they are hitting on me but as that they are appreciating my work. Cause it’s just the image that we put on YouTube that they like. (laughing) Agar itna hi pyaara hota main, toh bachpan se hi mujhe pyaar karte. Hussain : I want to be in people’s hearts. Not just in their laptops and Facebooks. Q – You guys have played girls in many of your videos. So how do you get those expressions and gestures and those ‘adaien’ properly? Shehry : It comes naturally to me. I observe girls when they talk. Like Dolly Aunty, she is a mixture of all my mom’s friends together. Hussain : It exaggerated a little to make it funnier. But that’s basically how they would interact. Atif : Its reality too. Mariam is like a lot of girls you see around New York City. They have that accent. It’s really funny actually. And we wanna put it out to people via this interview. Q – Who is the laziest amongst you all? Hussain, Atif, Shehry (laughing) : Waqas. Waqas: Hey Khushi! Hi. I’m Lazy. And why you may ask, these guys might tell you better. Q – Whose the singer from the group? Hussain : There’s a competition between me and Atif. Atif : It’s Hussain. I sing and so does he. Hussain : I do it for fun but I think Atif has a bigger passion for singing. Q – Who is your inspiration from Bollywood? Waqas : Ek hi banda hai hum sab ke liye, the one and only Shahrukh Khan. Shehry : Shahrukh Khan because he is the best actor. He can make a person smile, laugh and cry. Hussain : Kuch kehne ki zaroorat hai kya? Samajh toh gaya hi hoga. Atif : In actors, its Shahrukh Khan. But in the directors, I would say Sanjay Leela Bhansali. Hussain : Yeah, I agree. Keep Bollywood to one side and his movies to one side. There’s no match for the movies he makes. He takes movie to another level. Waqas : And I would say Karan Johar too. He is really good at what he does. He and Sanjay Leela Bhansali are the best directors for us. Atif : I also like work by Rajkumar Hirani. We take inspiration from him. Q – If there was a movie being made on the life of you four, then which actor would you choose to portray yourself in it? Shehry (laughing) : Rajpal Yadav. But He is shorter than me. Atif : I would say John Abraham. Cause he was my inspiration. I started working out because of him. Hussain : My inspiration is Shahrukh but I wouldn’t say him because he is way up. I think Shahid Kapoor would play a better me because he is young and good actor. So he would play a good role of me. Q – Do you guys get bombarded or swayed by girls when you got out in public? Shehry : We don’t get bombarded but yeah girls do come up to us. Just like yesterday, we were at a restaurant and this group of girls came and they weren’t sure whether we are DhoomBros or not. So they started like google-ing it to make sure that it was us by putting the phones next to our faces to make sure. There were a lot of girls that time. But girls are good. Guys would be a problem. Cause in my case, I am the girl in the videos most of the time. So it would be a problem for me. Q – Shehry and hussain you guys have moved to Texas now. How do you guys manage being apart and still make videos? Is it hard? Atif : We as a group have an understanding with each other. We manage it somehow. Some parts we do there and some parts Shehry and Hussain do here and then we match it up. It’s all because we understand each other so well. Hussain : When we were moving, that time people were like the DhoomBros are ending and there will be no more DhoomBros. But DhoomBros are something that’s’ never gonna end. Shehry : Agar hum rahe naa rahe, humare bacche rahenge, InshaAllah. Q – You all play different characters in the videos. If you had to pick one which one of them would be your best friend and which one would be your sworn enemy? Shehry : For my best friend, I would pick Dolly Aunty because she would kick all my enemies. And I just dislike Mariam so much so she would be my enemy. I don’t get why is she always so tired and hot and wants to sleep the whole time. I hate her so much. But She is inside me somewhere though and she wants to come out and I hate her. Atif : My best friend would be Mariam. I love the way she talks. It’s so funny. So she would keep entertaining me all my life. She’s tired, she’s sleepy and she’s hot. (laughs) And my enemy would be the guy I was playing in the video ‘Blessings of Ramadan’. I dislike that person so much. Hussain : I think the way it works in Dolly Aunty videos. Dolly Aunty is our enemy and Mariam is the one we want. So that would work out for me even in real life. So Mariam will be my best friend and Dolly aunty would be enemy. Waqas : I would want my BFF to be Daaku from ‘Daaku to the rescue’ because he would save me from situations and help me. And my enemy would be that one character that Shehry played in ‘Annoying Brown Guys’ who I guess is basically Mariam and she says “Main morning mein nahi, main sirf evening mein run karti hoon.” That character I would hate. Q – Where do you guys see yourself in the next five years? Hussain : I wanna go to Bollywood. InshaAllah. I’m working extremely hard to get to that position. Shehry : I just feel like we need to do something for Pakistani media. Because India has always been great so I just feel that we should bring Pakistani media ahead too and show their culture to people. I feel that we should show Pakistan media to Indians and through that we can try and increase the bonding between the two nations. Atif : I want people to say that they are Pakistani or Desi and they are going on the top. Waqas : So at the end of the day, altogether our five year goal is to take the Pakistani film industry where it has never been before. And InshaAllah, we believe we will do it together. Q – Lastly, any message for the readers and your fans? Waqas : Thank you for the love and support that you guys have given us. If it weren’t for you guys, we wouldn’t have been even close to where we are right now. Atif : Keep Loving us. We wanna keep making you guy smile and whatever we are, we are because of you guys. We want you to take us to the top and thank you. Shehry : For all my lovers out there, YOLO. Whatever we do today, whatever we have done in the past is just only and I really mean it, only for you guys. I don’t wanna say much. I just wanna do good work and reach people’s hearts. I just wanna tell you that there’s a lot more work coming from us and we will do better each time and our fans will be proud of us. Hussain : Keep loving me, keep loving us because it motivates us to work better and harder and be funnier and be more entertaining. That’s all. We’ve been doing this from last 5 years. By now, anyone would’ve gotten tired but we never get tired. And it’s because of our fans that we keep on going. Thank you so much and please keep supporting us the way you guys do. Atif : There’s no Hussain, Shehry, Atif or Waqas. It’s just DhoomBros. Waqas : Whatever we have done in the past will seem like a child’s play in front of what we’re gonna be showing in the following year.and Thank you once again for your love and support.